Among the most talked-about news in September 2015 was the John Patterson case, the 35-year-old American man extradited to Korea to revisit a notorious murder case in 1997, also known as the Itaewon murder. He is now facing trial on charges that he murdered JO Jung-pil, a South Korean college student, in Itaewon, Seoul. JO was found dead in a hamburger restaurant’s restroom with multiple stab wounds on his neck, but to a lot of people's surprise, Patterson was ruled innocent and he flew back to the U.S. where he has hidden for 17 years until he was extradited to Korea last month to revisit the murder case. This whole incident reminds us of one particular film: director HONG Ki-seon’s Where the Truth Lies, a 2009 film based on the Itaewon murder case. JANG Keun-suk, who is now an Asian star, played Pearson who was created after Patterson, and towards the end of the film, JANG showed a strong impact as he left the site, leaving the prosecutor behind. That scene inevitably delivered the message that we lost the real murderer, and that this case must be revisited. Likewise, the issues raised by the film are now back to us in real life. Courtroom dramas have always existed in Korean cinema. If not conventional courtroom dramas, Korean cinema still frequently presented courtroom scenes or attorney-driven film. In classic Korean cinema, women were often depicted to make a confession or apology in tears in the courtroom. SHIN Sang-ok's A College Woman's Confess (1958) would be a good example. In the 1990s, a.k.a the “renaissance of Korean cinema,” a few films described the courtroom in various genres. Only Because You Are A Woman (1990) deals with a social issue, and Bedroom And Courtroom (1998) belongs to the comedy genre. However these were just one-time events. It was since 2010 that courtroom drama films have formed a trend. Therefore Where the Truth Lies would be a special precursor in the context of courtroom films in Korean cinema, although it was not a great success either in terms of box office performance or film criticism at the time of release. Since Where the Truth Lies, however, there has come a series of significant films, either courtroom dramas or films featuring court scenes. Among such films are Silenced (2011), The Client (2011), Unbowed (2012), The Attorney (2013), The Unfair (2015), and The Advocate : A Missing Body (2015). Silenced (2011), Unbowed (2012) and The Unfair (2015) are pretty much in the same vein as Where the Truth Lies. These movies are based on true stories that have made influential news in real life and directly bring up the evil and unjust aspects that triggered the cases in the first place. Silenced deals with the crimes committed in a special school for deaf teenagers, where the principal and teachers beat up and raped the students. KONG Ji-young, a famous Korean novelist, collected facts and turned them into a novel, which became a best seller and was adopted for the film. Unbowed is more clearly focusing on the courtroom. A professor, being unhappy about the trial he was in, went to the judge's residence with a crossbow to threaten him. However, instead of framing it as an individual crime, the film tries hard to reveal the problem of the whole judiciary system of Korea. The focus of the movie is neither why he shot a crossbow nor whether he really shot it. Its focus is more on the ways in which the Korean judiciary system deals with the crossbow case. In doing so, the film points out the problems of the judiciary system raised during the trial and depicts the fight of the attorneys and the accused against the whole system. It is a courtroom drama directly blaming the courtroom itself, which shows a poignant irony. The Unfair is inspired by the Yongsan demolition tragedy in 2009, where tenants died in fire during the forced demolition of the buildings. Based on the incident, the film dramatizes it with two victims: a young police officer putting down the riot; and the young son of a tenant family fighting against the demolition. This case goes to the courtroom, where it is dealt with more at the level of the entire society rather than just an individual’s tragedy. In this aspect, this film adopts the same strategy as Unbowed. The film's central question is who is responsible for the confrontation site where two people were killed, and this question is accentuated within the judicial logic each presented by the prosecutors and attorneys. There are movies with a different approach from Silenced, Unbowed and The Unfair, where the characters and therefore the real-life people are more clearly in the focus than the incident itself. The Attorney (2013) would be a good example. It features SONG Kang-ho, a renowned Korean actor, and became the second best selling film in 2013, crossing 10 million admissions. The real-life person that this film has chosen is ROH Moo-hyun, a former president of Korea, but not ROH as the president but as an attorney before his presidential days, when he was an attorney. What is interesting in this trend of courtroom drama in Korean cinema is that a totally different type of courtroom drama has also been visible. The Client would be a good early example. It puts itself within the frame of a genre film rather than relying on the real-life case or a person. A strong suspect is found for a murder case of a woman, and the trial is full of reversals. This film occupies a special position in Korean courtroom drama because it focuses on the generic pleasure rather than taking a social approach. The director SOHN Young-sung once defined this film as "a movie about storytelling." 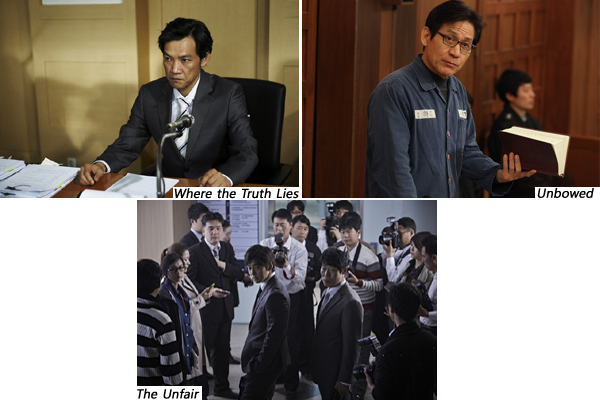 As of now, 2015, Korean courtroom drama has a variety of potential paths. Recent examples may include The Advocate : A Missing Body. It may not be a courtroom drama as a whole, but it could well be a “half-courtroom drama,” featuring the heated reversals in a courtroom that is a signature trait of courtroom drama. For the first time in Korean cinema, it was done in a supreme court set, which received a lot of news attention. At the same time, a corrupt yet courageous attorney is introduced, depicting his sense of justice outside the courtroom, which is comic and thrilling at the same time. Sometimes he is like a detective rather than an attorney. 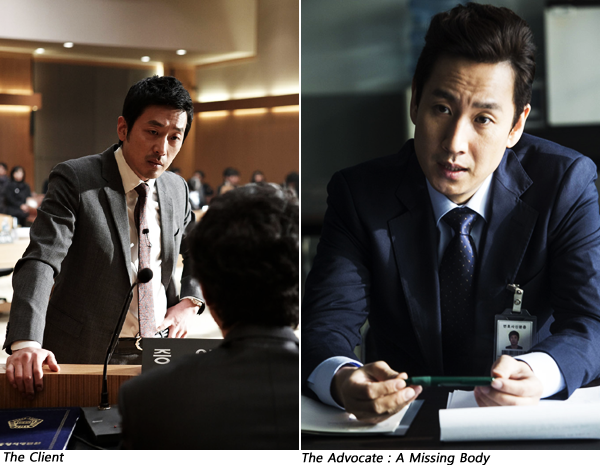 Thus, The Advocate : A Missing Body looks like a blend of the courtroom genre and detective genre, and it would be just one example of the courtroom drama variation. The Korean courtroom drama genre has many possible paths. Some will deal with the reality and people, while others are pursuing the generic pleasure.